KIS performance Team Coach and XRCEL Athlete Scott DeFilippis delivered another great race grabbing the number 7 spot. 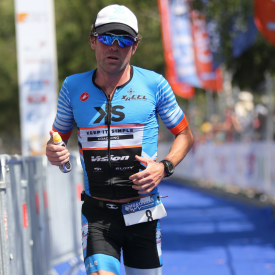 Charleston, SC (August 21, 2018) – XRCEL Athlete Fuel sends out a big congratulations to its ambassador and KIS Performance Team coach Scott DeFilippis for his 7th place finish in what some may consider the world’s most difficult iron distance race, Embrunman. XRCEL Athlete Fuel is a revolutionary extended release carbohydrate supplement formulated with patented pH and temperature responsive micro-gel technology developed by New World Pharmaceuticals, LLC. XRCEL is a caffeine and banned substance free supplement designed to provide athletes with extended release muscle and brain fuel so that they may get the most out of their training and competitions. New World Pharmaceuticals is based in Charleston, South Carolina. For more information, please visit http://www.NewWorldPharma.com.